Next in the line-up is the Cherry Mobile Cosmos S which flaunts 5 inch IPS screen, 18Mp BSI autofocus rear-facing camera paired with 8mp front camera, 1.5GHz quad core MT6589T , 1Gb RAM and 16Gb of internal storage. 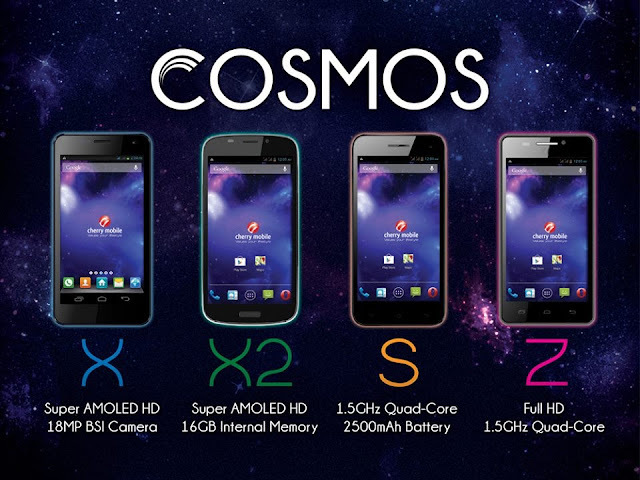 Lastly, the Cherry Mobile Cosmos Z sports a 5 inch Full HD IPS display, 1.5GHz quad core MT6589T processor, 8Mp BSI autofocus rear-facing camera, 1Gb of RAM, and 8Gb of internal storage and dual SIM functionality. The Cosmos X2 will be available in the market this mid-August while the Cosmos S and Z this late August. The pricing of these smartphones are not yet revealed . For more details, blog, unbox and review about Cherry Mobile Cosmos android mobile phones, check out Cherry Mobile website and their Facebook Page or visit the nearest Cherry Mobile store, kiosk and accredited dealers for other inquiries.